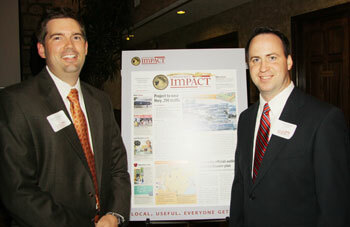 John Garrett (right) has found success in his Community Impact Newspaper. In just four years after the company opened, it generated $6.9 million in revenue and an expansion into northwest Houston. With Garrett is Jason Culpepper, also an SHSU alumnus, who runs the Cypress-Fairbanks edition of the Community Impact Newspaper. John Garrett, a 1997 Sam Houston State University graduate, started the Community Impact Newspaper in 2005. By 2010, it had grown from three employees to be the most widely distributed newspaper in Austin and the surrounding areas—with 65 employees and a circulation of 450,000. His Community Impact Newspaper serves the Central Texas area, producing seven separate, free publications that serve Round Rock, Pflugerville, Cedar Park, Leander, northwest Austin, central Austin, Lake Travis, Westlake, Georgetown, Hutto, Taylor and southwest Austin. Last year, he expanded his publication to reach the Cypress-Fairbanks area of northwest Houston, run by fellow Sam Houston alumnus Jason Culpepper, a 1999 graduate. Additionally, on Oct. 1, Garrett will launch a second Houston paper in the Tomball/Magnolia area, which will bring the total number of papers distributed in Houston to 150,000. The company has been recognized in multiple focus groups as the “first and only news source” where local residents get their news and is the only 2009 National Newspaper Association award-winning newspaper in Central Texas. “There are many community newspapers being printed today, and there are even several that depend solely on advertising revenue, just as Community Impact Newspaper does,” one of Garrett’s nomination letters for the award said. “However, I haven’t seen any with the standard for excellence, honesty and integrity that John has demanded from day one. “John is a remarkable talent with an innovative business that has changed the way a region of the state receives local news,” another letter said. Garrett, who lives in Round Rock with wife Jennifer and three daughters, said his degree from SHSU has been extremely helpful to him in his career. “The writing and producing classes I took for broadcast actually were very helpful for print. For some reason, I decided to take extra accounting classes, which have helped me understand balance sheets and profit and loss reports,” said Garret, whose company generated $6.9 million in 2009. He credits another SHSU alumnus for getting his career off to a great start. “James Pollard [’52] hired me at the Houston Chronicle to work as an intern and hired me on full time when I graduated,” he said. Other experiences at SHSU also helped him get where he is today. “Sam Houston gave me the opportunity to learn how to lead an organization,” he said. “My experience as president of Theta Chi Fraternity taught me how to achieve goals and how to lead people who come from different backgrounds and value systems. The Student Activities Office in particular did an amazing job of giving students who wanted to do something special at Sam that opportunity.